The S&P500 is resting after the recent run up and AAPL lost its mojo. Stocks closed under 1500 on elevated volume. Today was the third down-day out of the last four as the hangover from the pervious euphoria is catching up with the market. Everyone knows the market cannot go up forever, so some selling is normal and expected, but what we really want to know is if this is where the market rolls, over or if this is an opportunity to buy the dip. So far the selling has been contained and not nearly as dramatic as one would expect after the headlines we’ve seen. Unexpected strength is bullish even when accompanied by down-days. This is not to say selling cannot accelerate to the downside, but if the market finds a bottom and support on Friday, that means near-term selling has climaxed and the rally continues. A lot rides on tomorrow and it will give us greater insight into where the market is headed. Buy the dip if we find support, but if the market continues sliding, let it find a floor first. The uptrend will resume, but we might see better prices first. If the market decisively regains 1500 tomorrow, then it will be a good buy signal, but if weakness continues, look for support at 1490 or 1475. The surge of buying might be behind us and the correction has begun. If tops were obvious, we’d all be rich by now, so we just have to trade what the market gives us. The market probably still has more upside, but we are late in the move and smart money is locking in profits and waiting for the next trade. No reason to force a trade either long or short here and the best call could be sitting this one out. 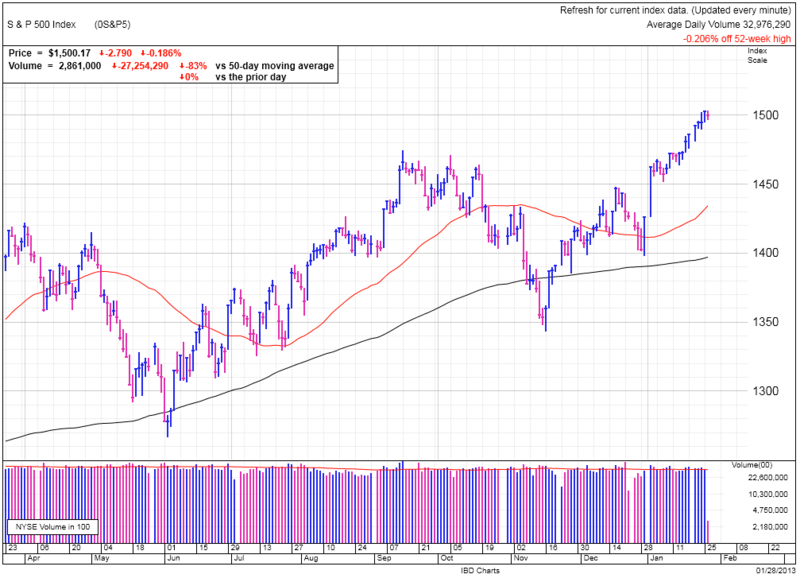 AAPL is stuck under $460 and everyone should give up on the chances for a quick rebound after 6-days at these levels. In fact, we still might see new lows out of this stock as hopeful holders give up on the rebound. The best trade is stepping to the sidelines and waiting for the next tradable opportunity, either higher or lower from here. A break above $465 is buyable and under $450 is shortable, but take profits in these trades early and often because this is now a volatile trading stock and profits will disappear as quickly as you find them. 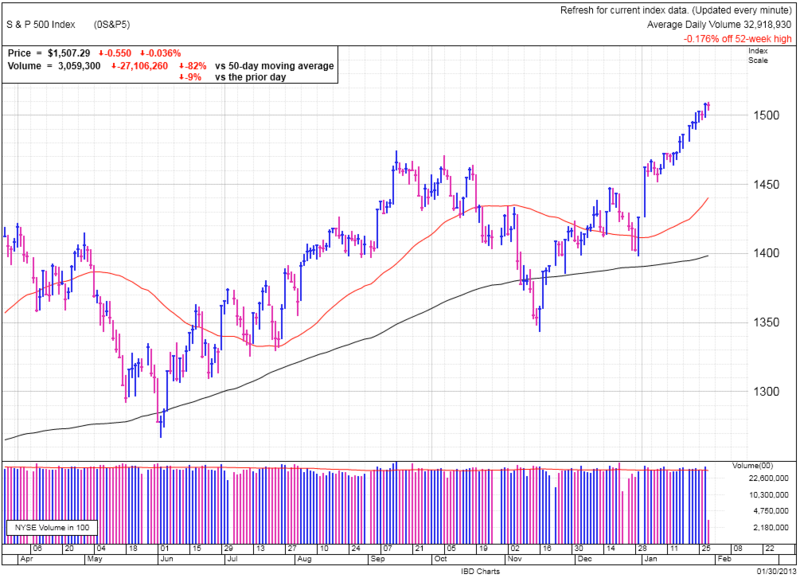 The S&P500 tests support at 1500 and AAPL struggles with resistance at $460. One is headed higher and the other lower and it is the opposite of what most think. The S&P500 dipped under 1500 in early trade following yesterday’s 0.4% decline. Red days are normal and expected, especially after the long string of up-days we saw over the last few weeks. The bigger question is if this is the near-term pullback everyone’s been waiting for, or just a modest dip before resuming higher? Modest dip or pullback to support, either way this will be limited selling and present a buy-the-dip opportunity. I don’t know if we’ll find support at 1500, 1490, or 1475. Heck, we could even head all the way back down to 1450 and I wouldn’t be concerned. Rallies pullback, that’s what they do and there is no reason to over analyze a situation. For the swing-trader with some profits, we are getting pretty far along and any point over the last few weeks would have been a good time to lock in profits and wait for the next high probability trade. Swing-trading the indexes with a little bit of leverage to spice things up can be quite profitable. 2x leverage means a 2.5% move in the indexes yields a 5% return. Do that 12x over the course of a year and it compounds to 80% ROI. Not bad. The key is getting those 5% gains, locking them in, and then waiting for the next high-probability trade. You don’t need big moves to make money in the markets, taking a little here and there add up over the year. For the longer-term trader, the economy is still looking up in spite of any near-term weakness. Recoveries take time and the most patient often win in the end. Just expect some near-term volatility and don’t let it shake your resolve. Bear markets start when people least expect them. This rally is turning 4 in two months and that is pretty old for a bull. But that is under normal conditions and the 2008 bear market was anything but normal, so we should also expect the subsequent rally to be abnormal too. The lack of widespread complacency is what keeps me positive on this market. When looking for a major top, we need to look at a bigger audience to judge complacency. Too many normal people are still afraid of equities for this to be a major top. When you need to be worried are when you mother-in-law is giving you hot stock tips and we are a long way from that level. AAPL was turned back by $460 again and that level is providing a lot of near-term resistance. Failing to close above $465 this afternoon tells me the chances for a quick recovery are dead. Further, if the stock cannot break $460, soon, I think lower prices are in store and this would be a good time for people to cut their losses and wait for the breakout above $460 before buying back in. Everyone bought AAPL for a reason and if that reason is no longer valid, they should get out. Trivial decline in the face of negative GDP, how can that be? 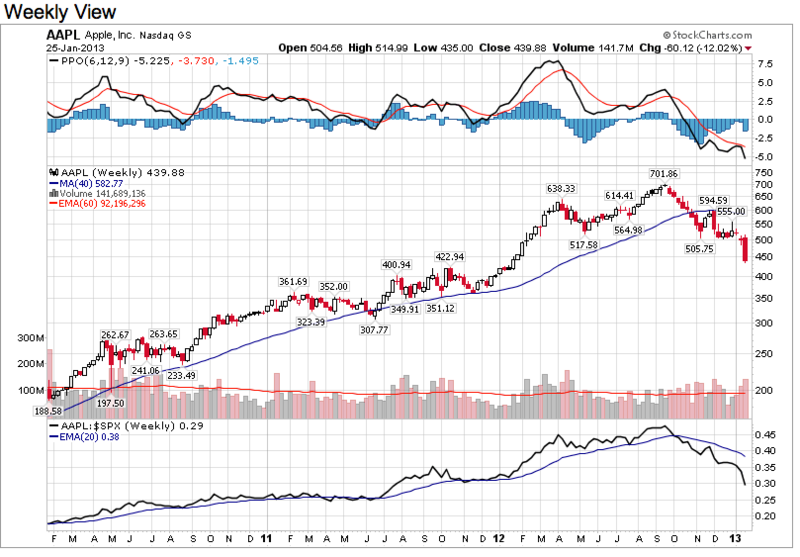 AAPL struggles with $460, while AMZN is near record highs, what gives? Stocks started strong, but finished at the day’s lows and just a hair above 1,500. What began as surprising strength in the face of a negative GDP headline faded into the close. Volume was above average, but lower than yesterday. This shows sellers were not rushing for the exits and it was more a lack of buying that let the market drift lower. The other noteworthy thing is today’s 0.4% loss was the largest decline of the year. Just a few months ago, a negative GDP would have crashed the market, yet today we set a new intra-day high shortly after the headlines hit the market. What gives? Journalists and fundamentalists are coming up with various excuses, but the truth is holders didn’t care about the headline and chose to keep holding, expecting higher prices ahead. It doesn’t matter if these traders are right or wrong, the fact remains they want to keep holding and they are not going to let some silly headlines flush them out of the market. We find ourselves in a market with limited supply because no one wants to sell, and not only that, the steadily rising prices are converting former pessimists into buyers. The real takeaway from today’s trade is this market is not afraid of headlines. Risk of unexpected bad news is something traders normally live with, but the market is demonstrating a carefree attitude toward fundamentals and that is giving investors a free pass to be long. Markets decline for various reasons, but it looks like this one won’t top until we run out of buyers because headlines cannot dent this rally. While the day finished in the red, the market’s resilience in the face of unexpected negative headlines is quite bullish. 0.4% is trivial if we talking about unexpected negative GDP. This doesn’t mean the coast is clear and this move is near the end, but it doesn’t look like it is done yet. Look for a bounce off of 1500 tomorrow to confirm a continuation. The end is near and we could be in the early stages of the top. Failing to hold 1500 would be a change in character and we could see further weakness. At this time I don’t expect a selloff to be anything more than testing recent support. Holders have shown a lot of resilience in the face of some highly negative headlines and if they haven’t cracked yet, I don’t expect a modest pullback will send them running for cover. APPL failed to hold $460 for a second day. I’ll give the stock one more shot to surge higher Thursday, but if we don’t see strong rebound from these oversold conditions, this is going to become AAPL’s new home for a while. A lot of people are dumbfounded by how AAPL can have record profits and be down by 35% while a company like AMZN misses and is holding near record highs. It all comes down to supply and demand. Everyone loves AAPL and anyone who wants some already has as much as they can fit in their portfolio. AMZN is the scariest stock on the street and investors are afraid to own it. Contrarian investing works because while AAPL is extremely popular, there is no one left to buy it. On the other hand investors avoid AMZN, meaning there are tons of new buyers available to keep pushing the price higher. Supply and demand; understand how it works and the market starts making a lot more sense. Teflon rally shakes off economic contraction. AAPL struggles with $460 and chances of a quick rebound are fading fast. Stocks traded modestly weaker on unexpected news of economic contraction in the 4th quarter, but given the magnitude of the headline, the market’s reaction is surprisingly subdued. People can trade technicals, fundamentals, or the market. Technicals say we are overbought. Fundamentals say we are two-months away from a new recession. Yet the market could care less and is holding near 5-year highs. Markets are a collection of traders buying and selling their opinions and expectations. Fundamentals and technicals are secondary because they only influence trader’s opinions and expectations, they don’t actually move markets. More importantly, we only care about changing opinions and expectations. Buying and selling is what makes markets move. Traders with existing opinions have already placed those trades and are waiting. It is traders who are changing their minds that provide the buying and selling that moves prices. Today’s economic contraction report did little to change anyone’s mind, so prices stayed the same. Bears remained bearish and bulls stayed bullish. The bad news for bears is that headline was about as spooky as it gets and if any bulls were hanging on by their fingertips, that would have pushed them over the edge. This proves bulls are confident and holding on for higher prices regardless of what the fundamentals or technicals show. Journalists will point out the half-full parts of the report to explain this resilience, but their job is to find reasons to explain the market’s move, or in this case the lack of a move. The truth is bulls are getting greedy and bears are impotent (already out of the market). When a headline like this cannot change a bull’s mind, the only one left to change is bears buying into the market and that is why we should expect higher prices over the near-term. If headlines of economic contraction can’t spook bulls out of their positions, not much else will. If this market cannot be brought down by negative news, then the only other thing is running out of buyers. As long as cynics remain, the market will have fuel to continue rallying. Eventually bears will develop a “if you can’t beat them, join them” attitude and buy this market Those that jump on the bandwagon sooner will profit more than those that wait until the very end and buy the top. It is okay to be wrong, it is fatal to stay wrong. The sooner we recognize and fix our mistakes, the more successful we will be. Markets can go down for any number of reasons, but this market is demonstrating an immunity to negative news and that greatly mitigates unexpected downside risks. This rally will eventually turn over, but only after everyone has jumped on the bandwagon. With today’s resilience, and if it holds through the close, we should expect the pace of bears turning into bulls to accelerate, but this is the last push toward the end of this rally and those that get in too late will be left holding the bag. AAPL finally broke above $460 this morning, but is struggling to hold this level midday. Moving into last week’s gap will be a significant technical milestone. There are a lot of new buyers and regretful holders at the $460 level, but once we get through their selling pressure, the clear air of the gap will give less resistance up to $490 because there will be fewer people trying to get their money back. But we have to break above $465 first. We are in the fifth-day of the post-earnings selloff and the longer we trade at these levels, the less likely a V-bottom becomes. If we fail to break into the gap this afternoon, chances of a quick rebound are practically nil. The two remaining options are a grind higher and more selling. Since so many people are still bullish on AAPL at this valuation, I see a much larger pool of available sellers (current holders) than new buyers. If someone does not already own APPL at these levels, they probably are not going to buy it no matter how cheap it gets. That lack of demand from new investors will be a real headwind turning this stock around. 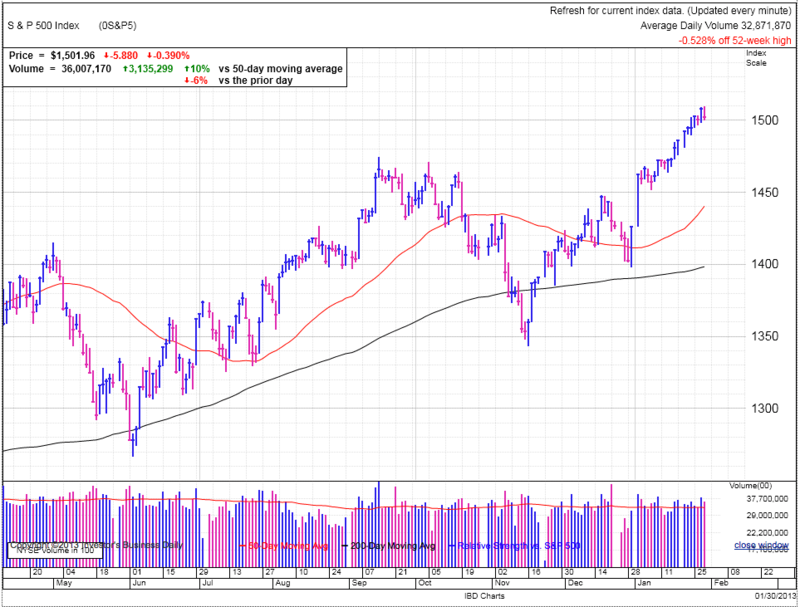 The S&P500 set another new high and is poised to continue. AAPL flirted with $460, but was unable to break above. Another couple of days of sideways trade will make a sharp rebound unlikely. 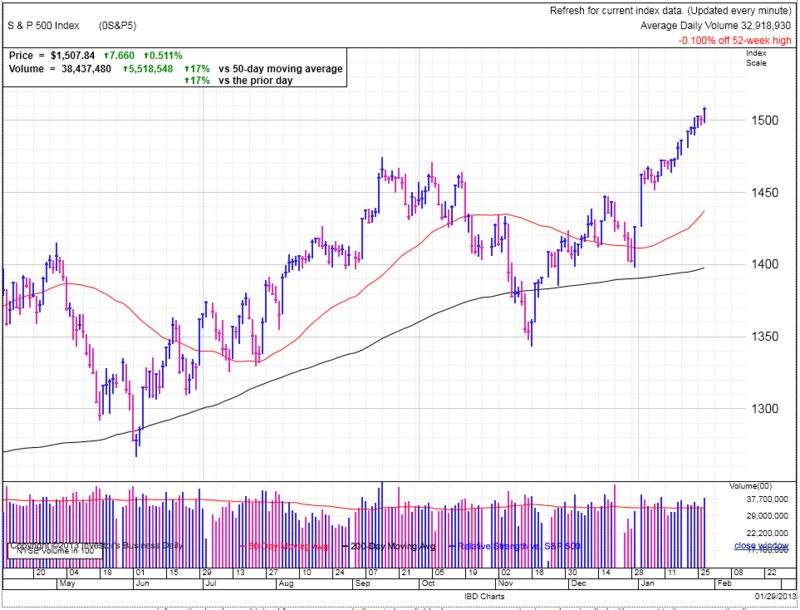 The S&P500 set another new high in above average volume. The more people wait for the pullback, the higher this thing goes. Every market tops, but they usually go further and longer than most expect and that is clearly the case here. Virtually everyone holding a diversified basket of stocks is showing a profit with the market at 5-year highs. When things are going this well, there is very little selling pressure as holders keep holding on for more. Eventually this ride will come to an end, but we are not there yet. As long as there are regretful investors watching this market rally without them, there will be fuel to keep pushing us higher. The market held 1500 for a couple of days and today’s break above 1504 confirmed the continuation. The breakout was a modest 0.5% and relatively contained. We need to watch for an unsustainable surge higher, but that will be a move well in excess of 1% and far higher volume than today’s 17% above average. Yesterday’s dip was all the market needed to refresh itself and while we are getting further and further extended, this market still has legs. We might only see another 20 or 40 points of upside, so jumping in here is clearly late to the party, but there is enough upside left that shorting this market is not advisable. Today’s pop could be the false breakout that dragged in the last of the buyers, but it sure didn’t have a capitulation feel. As always, the market can get spooked by its own shadow and nose over without warning, but the market is in a rallying mood and ignoring negative headlines. 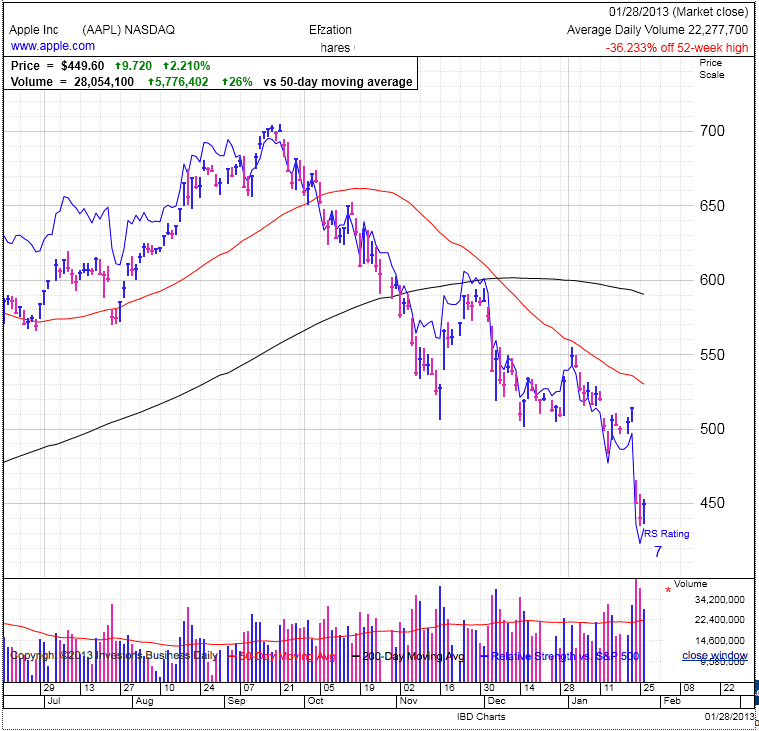 AAPL rallied modestly on light volume. It tried to recover $460, but it could not break thought this level. The encouraging thing for AAPL is the light volume shows sellers are taking a break for the time being. Maybe hopeful holders are holding a little longer as the expected rebound is about to take place. V-bottoms happen over a couple of days and if AAPL continues trading sideways at these levels, that greatly diminishes the probability of a sharp rebound. If AAPL doesn’t trade sharply higher tomorrow, look for either a rounded base or more selling. Apple released an upgraded iPad without much fanfare. The one takeaway is they would not have done this if a completely redesigned iPad release was imminent, so one potential catalyst can be eliminated. The interesting thing about Apple dropping the numbering convention on the iPad means future upgrades will most likely revolve around memory and processor upgrades. Design-wise it is really hard to do much with a thin, rectangular piece of glass. The headwind AAPL will continue facing is the existing iPad and iPhone products are so good that few people see the value in upgrading for fairly incremental improvements in newer models. The market had an open invitation to selloff after yesterday’s dip and this morning’s early weakness, but it bounced back and made new highs instead. This price-action is supportive of 1500 and if we hold through the close, the market is not ready for a pullback. How far can this thing go? That is what most traders are asking themselves right now. They are interested in buying this market because last fall’s worries are ancient history, but they are hesitant to chase a market that ran this far and is poised for a pullback. They are stuck in this indecision, but each point higher pushes them closer to buying. The thing about chasing is it is not like a breakout or breakdown where everyone is watching the same levels and a flood of orders his the market at once. Chasing is a gradual phenomena where traders change their minds over time. 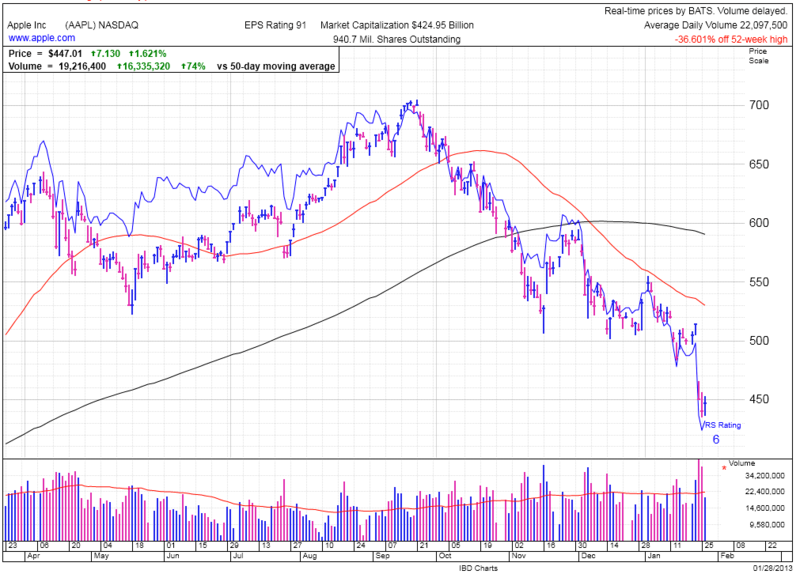 It is this steady stream of new buyers that allows the market to drift higher in spite of all the calls for a pullback. No doubt this cannot go on forever, but it usually last longer than most people expect and that is exactly what is happening here. One way these things end is when a larger wave of regret hits traders in unison after the market continues marching higher without them. Buying picks up and the pace of gains accelerates until most traders can no longer stand sitting out and jump in headfirst, but this surge marks the end of the rally as buying finally exhausts itself. So far this pause at 1500 shows buying isn’t getting out of hand just yet. I’ve been wary of a pullback for a few days, but the market’s resilience around 1500 is indicating support, not exhaustion. No one has a crystal ball and our understanding of the market evolves with each new piece of information. 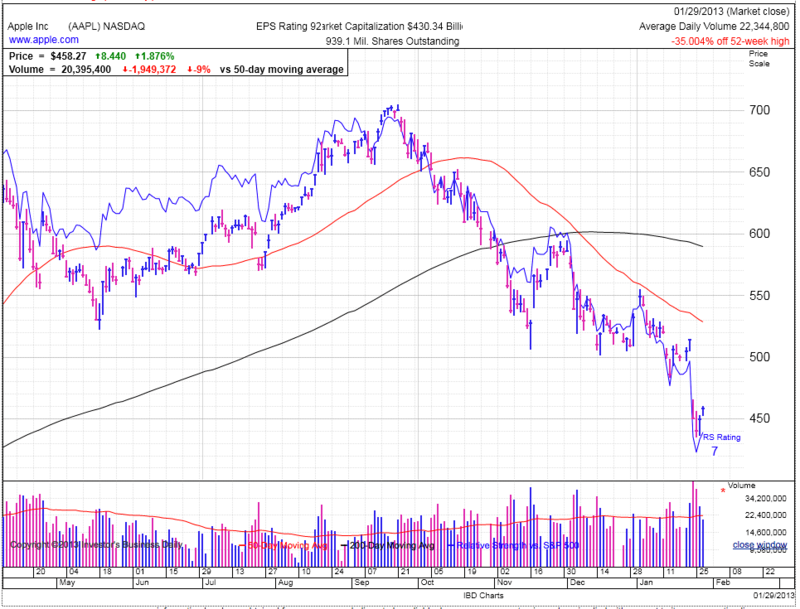 Barring a weak close today, the market is supported by new buyers and still has more room to run. My initial hesitation was due to stop-loss and breakout buying that pushed us through 1500. These buyers have limited resources and their support usually fades within a couple of days. Since we held these levels for a third day, it shows real support from follow up-buying and this is more than a short-squeeze. Markets don’t always exhaust themselves in a single push higher and we could see a rolling top here at 1500. Watch for a material violation of new support at 1500, but until then stick with the trend. AAPL rebounded from recent lows and is challenging $460 in late morning trade. A lot of buy-the-dip traders bought AAPL at $460 after earnings, only to watch it plunge under $440 within 24-hours. No doubt a lot of these buyers are filled with regret and looking to exit their impulsive AAPL trade at break-even. We also had people hold AAPL through earnings who failed to sell the initial dip to $460 and they promised themselves they would finally sell if the stock regained $460. Attitudes like this make technical levels behave like support and resistance. When regretful owners jump at the chance to sell at $460, that will hinder further advancement. While $460 will provide some resistance, the major roadblock up ahead is $500 where a huge swath of regretful investors would love to get their money back. We will probably bump up against $460 for a couple of days, maybe even turn back from it, but the real level to watch is $500. 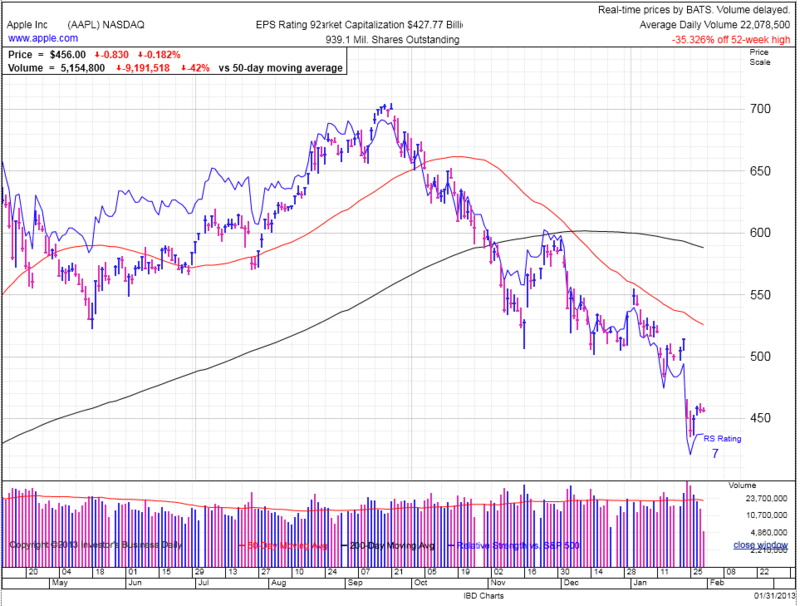 Any swing-traders should wait to buy the break above $460 and look to sell around $490. On the lower side a break under $450 signals a lack of support and we will see new lows. Markets broke the streak of up-days but that is a good thing. AAPL bounced today, but is this the real deal? 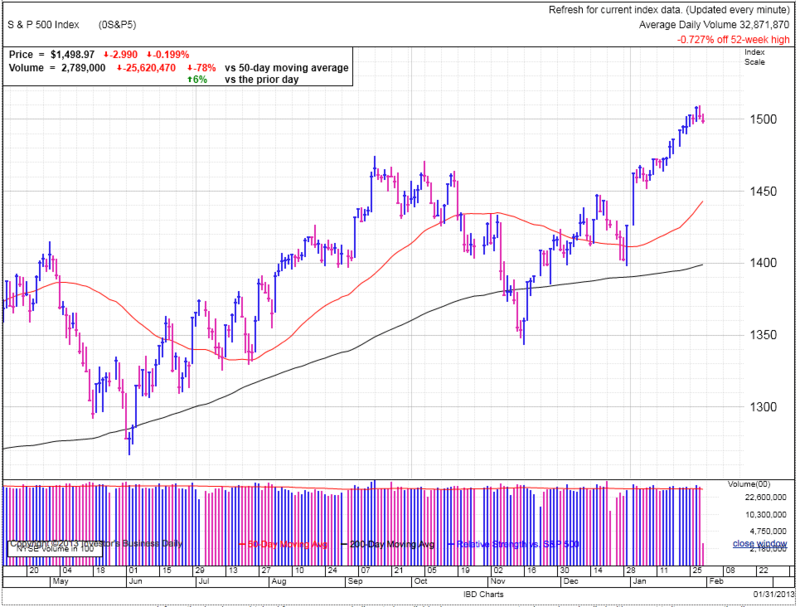 The S&P500 dipped less than 0.2% and ended an impressive streak of eight up-days. While the fractional decline doesn’t constitute material selling, it does break the streak and lets us move past the obsession with counting up-days. Volume was right around average as holders were not spooked by modest selling and the market closed a hair above 1500. This was the first time the market didn’t set a new closing high in nearly two-weeks. Buying took a break simply because there was so much of it since the start of the year. Trading would be easy if the market went up every single day, but we are not that lucky and actually have to work for our money. Today was the second close above 1500 and it would be nice to see two more closes at this level to confirm support. But at the same time, some selling here is normal, expected, and healthy. I would be more concerned about the sustainability of this rally if we kept heading higher than if we dipped and found support. 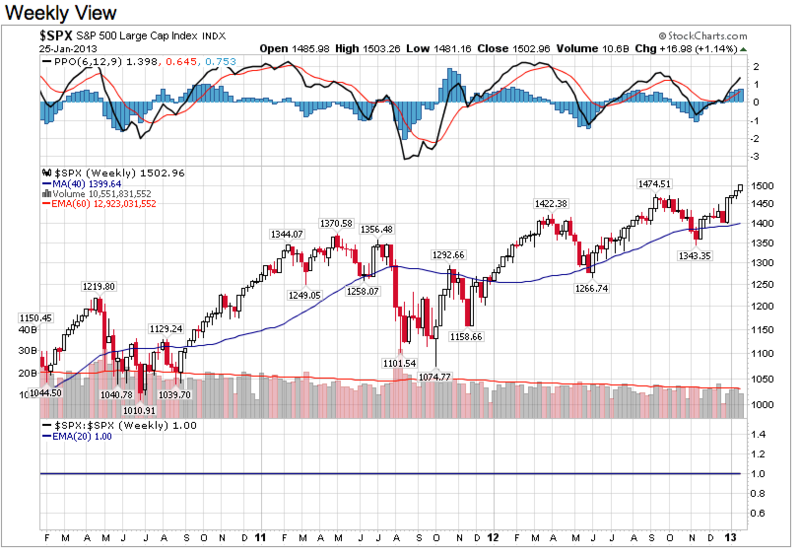 Complacency is creeping into the market, but it is just starting and not pervasive yet. There are still a lot of recent sellers watching this market rally without them and they are tempted to jump on any pullback. Big money managers under-weight this market are also struggling with the lesser of two evils, getting left behind or buying the top. But the longer they wait for the pullback, the more uncomfortable they become watching the market head higher without them. It is easier to justify losses when the entire market dips than explaining why they failed to keep up with a rallying market. It would be hard to count today as real selling. The dip was minor and volume was average. The market can refresh through either selling or sideways trading. Today’s move was sideways and supportive of 1500, but we need to hold these levels a couple more days before we can stop expecting a pullback. The market clearly wants to go higher and long-term investors should keep holding, but those out of the market or with shorter timeframes should wait a couple of days for the market to either pullback or build a solid base at 1500. A sustainable rally goes two-steps forward, one-step back, but not every rally is sustainable or predictable. We could continue rallying after today’s modest 0.2% pullback, but just because the market heads higher doesn’t mean we need to be part of it. If the market doesn’t look sustainable, sit it out. There are eleven months left in the year and there is no reason to force a trade that is less than ideal. We all know AAPL will bounce, the question is when. It still sounds like most people are claiming AAPL is oversold and poised for a bounce and no doubt they will be proven right, but we have to ask when and how much before deciding to make this trade. If a lot of nervous holders are waiting for that bounce, it won’t happen. If swing-traders are buying the dip, it won’t happen either. I’m suspicious of all the people who think AAPL is oversold and makes for an easy trade back up to $500. No doubt it will get there, but it might need to go through $425 first. People are very emotionally attached to this stock and I understand the reluctance to sell when it could bounce any day now. Rather that just cut out, set an upside target and downside stop-loss. Maybe $490 on the upside and $430 on the downside. Then stick to these levels. The market is trading sideways at 1500 and AAPL’s early rebound is filling owners with new hope. The S&P500 dipped under 1500 in early trade, but recovered that psychologically significant level by midday. A bit of sideways trade is constructive for a continuation. The market has seen few down-days this year and a little distribution and profit taking should be expected, even welcomed. The market isn’t worried about much here. The only negative story making headlines is AAPL’s collapse, but that damage is contained and largely a single stock event. Complacency is always something to be wary of, but it isn’t enough to bring the market down by itself. It isn’t complacency that tops out the market, but investors being fully invested when they feel comfortable. Running out of new buyers is the underlying structural event that causes complacent markets to peak. So while complacency is creeping in here, many investors who sold toward the end of last year are not fully reinvested yet and it is their buying that is holding up this market. It takes time for these sideline watchers to be won over and buy back in and we are still in the middle of this process. The market probably needs a couple down-days as part of the two-steps forward, one-back. This is the process of moving forward and don’t let modest weakness spook anyone. For those that are holding, they can keep holding. For those looking for a place to get in, wait for some weakness, but don’t wait too long because the dip will be shallow and quick. 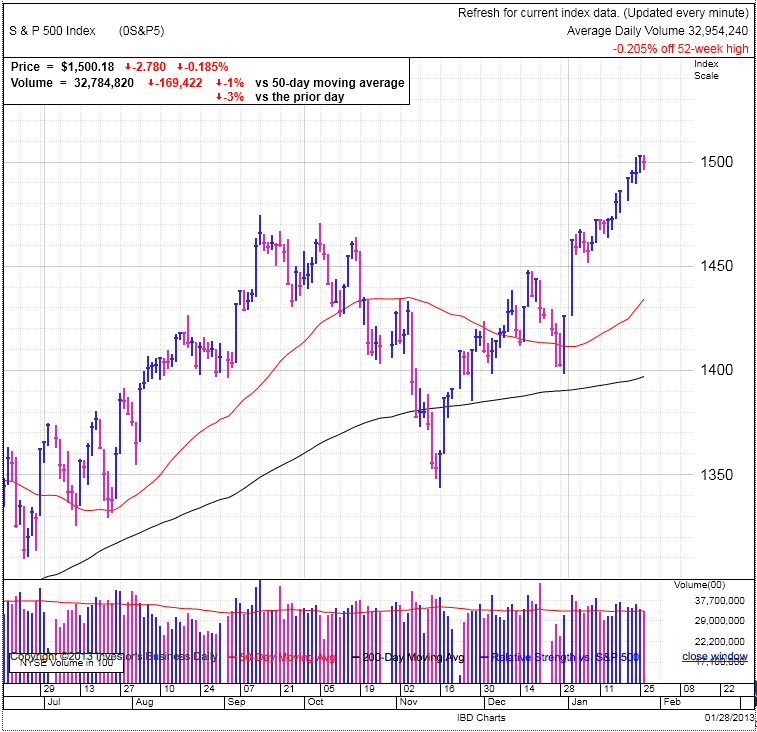 A move above 1505 says the market is ready to keep going. Of course a sharp advance on gigantic volume would likely be capitulation and signal a near-term top, but a more casual move above 1505 is putting the squeeze on shorts and pressuring those watching from the sidelines. This is a chasing rally and as long as traders are watching from the sidelines there will be fuel to propel this market higher when they start buying back in. We also need to be wary of a confidence rattling headline, but so far the market is pretty happy with the world and not too worried about last year’s headlines. AAPL bounced back from early weakness and recovered $450. We might even see the stock come up even more, but don’t be fooled, this is just a dead cat bounce to squeeze late shorts and keep hopefully owners holding on. Anyone looking for a V-bottom is going to be disappointed. Sharp bottoms form in over-sold stocks like we have in AAPL, but they also require an unexpected catalyst that decisively reverses the trend. With the next earnings report three-months away, it will be a long time before we get another actionable catalyst Further, at this juncture the market is no longer impressed with earnings out of AAPL and it needs to see something new to bring the stock back to life. The market has clearly decided AAPL is a mobile phone company with increasing competition from Samsung on the high-end and low cost-rivals on the other end of the scale. The market already expects strong phone sales, new phone models, and some kind of dividend/buy-back. None of these events will reinvent the company or stock. If anyone thinks AAPL will come back just because it is a great company will be waiting a long, long time. I know many people are reluctant to sell AAPL here, but at least put a plan in place. Pick levels above and below where you will sell the stock and stick to these. LA: How far can this go? Four-weeks into the year and money managers are already behind the eight-ball. As for AAPL, there are plenty examples of everyone’s favorite stock losing its mojo and trading sideways for years at a time. Will this be AAPL’s fate? The market has been up every week this year. Quarters often exhibit a consistent personality and so far this is starting out as a bullish quarter. This would suggest the rally has legs and any dip should be considered a buying opportunity. A lot of money managers are already behind their benchmarks and we are just a few weeks into the new year. Last year was a difficult year for big money and this year is not starting out any easier. At the end of 2012 many traders were reluctant to buy the Fiscal Cliff drama and chose the more conservative route of sitting it out. That would have been a smart move if the market imploded, but it didn’t and instead shot up aggressively, leaving many traders behind. From the first day of the year these under-invested managers were already lagging their benchmarks. Rather than chase too-far, too-fast, they waited for the inevitable pullback. But while they’ve been waiting, the market has continued higher, putting on even more pressure. 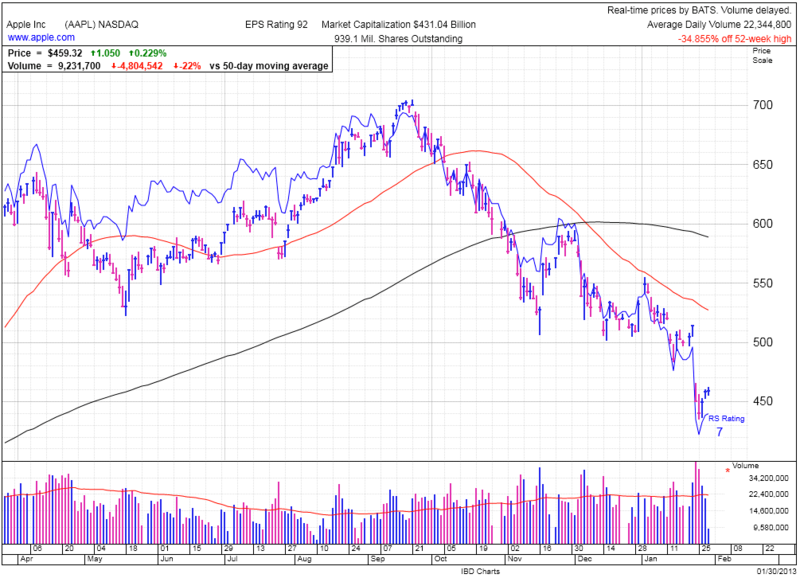 Things got even worse last week when AAPL imploded, but the indexes held firm. AAPL is the single largest holding by most money managers and this put them even further behind the indexes. It is already shaping up to be a cruel, cruel 2013 and the year is only beginning. Why all this matters is money managers are faced with a major dilemma, keep waiting for the pullback at the risk falling even further behind, or bite the bullet and jump on board the bandwagon. This is “deja vu all over again” as most money managers were stuck in this same place last January. As long as traders are waiting for the pullback, it won’t happen and that is why the market continues rallying. Once these guys reach their breaking point and jump on the bandwagon, the market will run out of new buyers and we nose over. While the trend is clearly higher, we could breakdown at any time if a nasty headline spooks the market or we simply run out of buyers. Rallies always end, but typically they go further and longer than most expect. We might see a dip to support this week, but don’t expect the market to breakdown. Smart money is buying the weakness, not selling it. There are a lot of people defending the intrinsic value in AAPL and if it was a great buy at $550, then it is a steal at $450. And while they might be right, the market doesn’t agree and we all know what happens to traders who argue with the market. There are plenty of examples of iconic businesses with great growth, but their stock price stagnated for a decade. MSFT is well off it’s all-time highs and has been dead money for over a decade. Same exact thing from CSCO. WMT finally regained its 2000 high thirteen-years later. SBUX peaked in 2006 and didn’t regain that level for five more years. Even AAPL traded sideways for over a decade after surging 700% between 1985 and 1987. Without a revolutionary new product, expect AAPL to join the ranks of has-beens, at least in traders’ eyes. The question any AAPL owner needs to ask is how long are they willing to hold to get their money back. No doubt we could see a bounce back to $500 and that would make for a great short-term swing-trade, but any strength in AAPL should be sold. MSFT, WMT, CSCO, and SBUX were great companies with strong growth and industry leading profitability, but that didn’t prevent the stock from stagnating for long stretches. There is a lot of profit to be made swing-trading AAPL, but buy-and-hold investors are not going to see new highs any time soon. Another up week as this rally knows no limits, but a strong market didn’t save AAPL traders who are stuck wondering what to do with their losing positions. The S&P500 rallied another 1.1% this week, making the 4th consecutive weekly gain and 8 out of the last 10. Weekly volume was lower than average but only because of the holiday shortened week. We are 61-points above the 10-week moving average and 102-points above the 40-week moving average. Outside of a few weeks of weakness in the final weeks of the year, the market has rallied non-stop from November’s 1340 lows. Following the financial news and trader forums, most of last month’s worries are long forgotten and the market is pretty pleased with the world. The market often swings between extremes of pessimism and complacency. Last November and December the world was falling apart and now everything seems fine. Funny how that works. The contrarian in me is suspicious of this rally, but the thing to remember is moves in the direction of the go further and longer than anyone expects. While people have called for a pullback since the huge Fiscal Cliff spike, the market has marched higher instead. Obviously this cannot continue indefinitely, but when in doubt, stick with the trend. Eventually this market will run out of new buyers, but it hasn’t happened yet. The market rallied over 100-points nearly non-stop in less than a month. While the market goes further and longer than anyone expects, there are times when the odds are in your favor and others when it is best to sit it out. Right now is time for sitting. The market will only pullback when everyone stops calling for a pullback. Are we there yet? Obviously not since the market is up eight-days in a row. The market can go even further if it means humiliating the experts and gurus, but while the market can go higher, that doesn’t make it a good trade. We are here for the easy, high-probability money and jumping on this rally is late in the game. While more upside might remain, that doesn’t make it a good trade. I received a lot of questions from holders of AAPL about sticking with their positions after last week’s plunge. The simple answer is only hold is if your original trading plan calls for holding in situations like this. If you bought at $550 and acknowledged that the stock could continue falling another 20% before rebounding, continue holding. But if you bought at $550 and didn’t expect the stock to dip under $500, then clearly your original thesis is invalid and there is no reason to keep holding at $450. AAPL could bounce at any time, but even if it does, selling is still the right thing to do. This isn’t about what works this one time, but about how we want to trade over our career. I have friends who are still holding CSCO they bought at $60 and waiting for it to come back 13-years later. Can anyone actually claim that is the smart trade? What is the difference holding AAPL at $450? Personally I don’t care if AAPL comes back or not, when a trade violates my original thesis, I get out. This is larger than a single trade and is about being a successful trader. Undisciplined traders might get lucky here and there, but the traders who stick to his plan will succeed over the long haul.